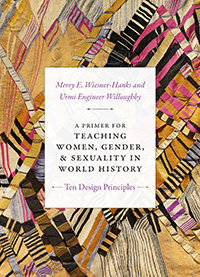 Published by Duke University Press (2018), A Primer for Teaching Women, Gender, and Sexuality in World History: Ten Design Principles is a guide for novice teachers as well as experienced teachers who want to reinvigorate their courses. Authors Merry E. Wiesner-Hanks ’73 and Urmi Engineer Willoughby draw readers into the process of strategically designing courses that will enable students to analyze gender and sexuality in history, whether their students are new to this process or hold powerful and personal commitments to the issues it raises. Wiesner-Hanks is professor of history and women’s and gender studies at the University of Wisconsin-Milwaukee.